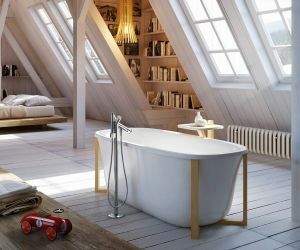 A collection of acrylic bathtubs using standard technology that not only adapts to all kinds of installations but also verges on interior design. 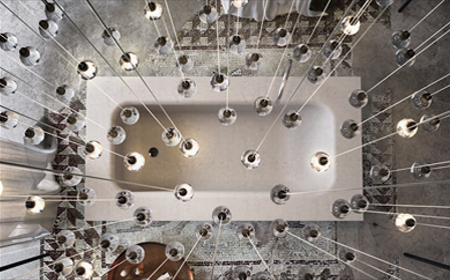 A bathtub is first and foremost a container for water and the human body. This was our starting point. 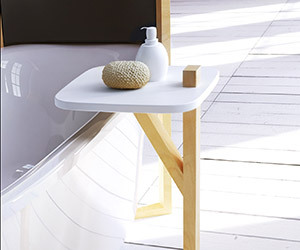 We experimented the deformation of a flexible surface (associable with the acrylic used to make the bathtub) under load, namely the weight of the water and the human body. This natural deformation in itself guaranteed comfort, cleanliness and structural stability, so we went on to optimize it and develop it until it demonstrated memory characteristics. 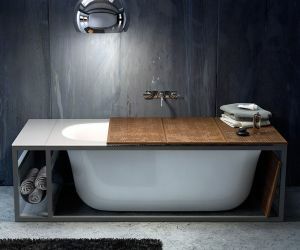 The shell is inserted into a frame which can be panelled or it can rest on a structure in natural wood, reflecting a less traditional bathroom concept.